When fishing with T-Roy's Guide Service, you will be fishing out of a fully covered 2003 North River Commander powered by a 6.0 liter Chevrolet, propelled by a Hamilton 212 pump. Capt. Troy uses only the finest equipment from Lowrance Electronics, Scotty Electric Downriggers, TR-1 Auto Pilot, Phenix Fishing Rods, Diawa Reels, and the finest terminal tackle from Pautzke, Uncle Larry's Spinners, Rocky Mountian Tackle, Radical Glow, Owner Hooks, Pro Troll and Gold Star. 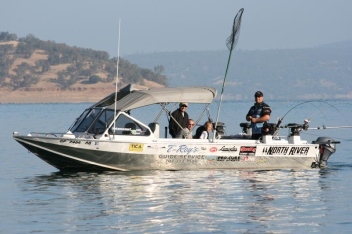 While fishing with T-Roy, you are not only getting the finest equipment, but also the knowledge that comes with 30+ years of experience fishing Central and Northern California Lakes.